In 1984, at the age of 20, Markus Molitor took over his father’s winery with the goal to produce Mosel Rieslings under the name “Molitor” in the tradition of eight generations. 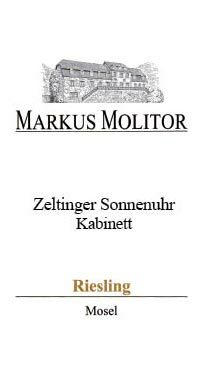 Markus Molitor wines are unmistakably terroir-driven, pure with the ability to age and develop for many years in bottle. This Kabinett wine is harvested at ripeness levels that have yielded a ripe and balanced wine at 7.5% alcohol.This vineyard site is located above and next to the Sonnenuhr site, also very steep, and partly with even more powerful slate soils than found in the Sonnenuhr, producing crisp and hearty wines high in extract, with firm acidity and a minerally finish on the palate. Ideally suited for particularly dry wines. Aromas of quince and baking spices on the nose; a succulent, subtly creamy, delicate palate impression with peach and nut characters and a savoury, mouth-watering salinity on the finish.